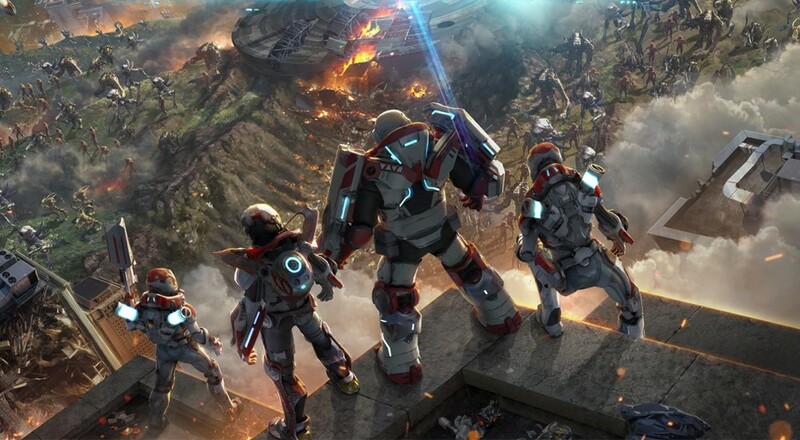 Alienation manages to do something few twin-stick shooters achieve these days: defy expectations. Through a combination of well-executed mechanics and a progression system for both the world and player that feeds into that “just one more level” mentality, the game is a time-sink waiting to happen. The setup to your impending slaughter of an alien species is familiar; aliens invade Earth, a long war ensues, and you’re now fighting to take the planet back. Each of the 20 story missions provide a little more narrative to your rampant murder-fest, but it is largely background noise to the action taking place on screen. Like many twin-stick shooters much of your time in Alienation will be spent moving around a map and killing anything hostile that heads your way. 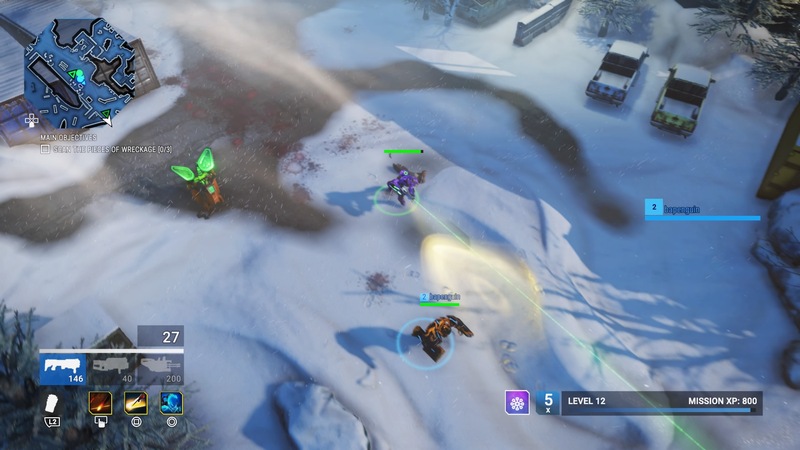 You can engage enemies up close with a melee attack, or shoot them from afar with a variety of weaponry. If you find yourself on the receiving end of enemy fire, you can use a rush move to dodge out of the way and get in a better position to retaliate. While Alienation succeeds at executing all of these core functions quite well (particularly once the difficulty starts increasing and you find yourself having to dodge away from enemies while simultaneously executing a reload) that’s not what makes the game noteworthy. It rises above similar titles in the shooter genre due to the way in which it handles progression at the character, world, and loot levels. There are three different character classes from which you can select to end the alien menace: Tank, Saboteur, and Bio-Specialist. Each class has a unique set of skills for their class along with three passive abilities that are common across all of them. These passive abilities can provide you with an instant revive should you die, buff your melee attack, and/or give your rush move a knockdown effect. Experience is earned by killing enemies and from special experience drops you’ll find in crates along the way. In an interesting twist on shooters, Housemarque has replaced the usual score multiplier with an experience multiplier. This multiplier increases as you kill enemies, which leads to gaining levels faster, and resets when you die. The faster you gain levels, the quicker you’ll earn ability points and be able to use them to upgrade your class abilities. The upgrades themselves are divided up into major and minor upgrades. For instance, the Saboteur’s cloaking power initially lasts for a few seconds and will be broken once an aggressive action (such as attacking) is taken. After investing one ability point to unlock it (major upgrade), the next point provides you with a choice of either increasing its duration or increasing your movement speed while cloaked (minor upgrade). These minor upgrades are toggles and you’re free to switch between them at any point. That minor upgrade is followed by a major upgrade, which adds a new effect where the Cloak will automatically re-engages after you attack an enemy, and then another minor upgrade, either increased duration or movement speed, and so on. You can spend a total of seven ability points on any one ability to get all of its major and minor upgrades, but you won’t be able to upgrade them all. The level limit is capped at 30 and after that any experience you earn is applied to “Hero Levels,” which increase your health points for every level earned. Page created in 0.2921 seconds.